(Nanowerk News) A City College of New York led-team has successfully demonstrated how to both enhance light emission and capture light from metamaterials embedded with light emitting nanocrystals ("Ultra-high-efficiency metamaterial polarizer"). The breakthrough, headed by physicist Dr. Vinod Menon, could lead to a range of applications including ultrafast LEDs, nanoscale lasers and efficient single photon sources. In the demonstration, the team used metamaterials having hyperbolic dispersion to enhance the light emission properties of the nanocrystals and simultaneously engineered an efficient light extraction scheme. 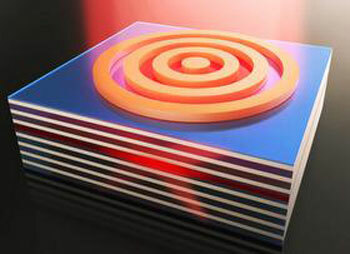 "The idea of metamaterials in the context of optics is that you can manipulate light and decide how you want it to behave in this medium," said Professor Menon a photonics expert whose specialty includes control of light-matter interaction at the nanoscale. While enhancement in light emission from such systems was shown by different groups, including Dr. Menon's, in the past, they were not useful since light did not come out easily from them, making their practical application an issue. The present work alleviates this issue and takes the first step towards developing practical light emitters based on metamaterials. Also part of the research team were scientists from the University of Alberta (Canada), Purdue University in Indiana. Part of the research was also carried out at the Center for Functional Nanomaterials at Brookhaven National Laboratory.